A 24-year-old man who was accused of murdering his girlfriend in Nipomo less than a year after he was deported to Mexico was released from San Luis Obispo County Jail on Wednesday after local prosecutors dropped their case against him. However, federal Immigration and Customs Enforcement (ICE) officials took custody of Julio Cesar Alonso, and he is now facing illegal immigration charges. On May 31, Alonso’s girlfriend Paulina Ramirez-Diaz was found stabbed to death at a home the couple shared with Ramirez-Diaz’s parents. Shortly afterwards, SLO County sheriff’s deputies arrested Alonso for the murder. Following Alonso’ arrest, it was discovered that he had been deported to Mexico in August 2016. At the time, The Desert Sun featured him in an article about deportation. Last month, the SLO County District Attorney’s Office charged Alonso with murder, and he appeared in court where he pleaded not guilty. But on Wednesday, the DA’s Office announced in a statement that it was dropping the criminal complaint against Alonso due to lack of evidence. Prosecutors could still refile murder charges if they uncover new evidence. Now, federal authorities are prosecuting Alonso for reentering the United States after being deported. Alonso faces a maximum penalty of 20 years in federal prison in his current immigration case. Alonso has a criminal record that includes multiple felony convictions. In 2014, Alonso began serving a four-year sentence for evading or attempting to evade a peace officer while driving recklessly, as well as for possession of a controlled substance, burglary, vandalism and driving under the influence causing bodily harm. Alonso was convicted of each of the crimes in Santa Barbara County. Why don’t we just adopt mexico immigration policy? Then we can treat Julio as if he was in his own country. I agree with Mitchel C, if the USA will not enforce its border laws and immigration standards, then we are not a nation. This illegal alien, Julio Cesar Alonso, has already shown he has zero respect for our laws, and his behavior will only grow worse. 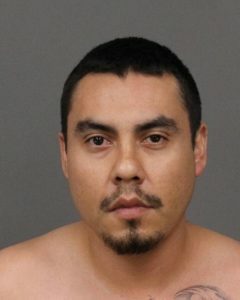 This illegal alien, as the story states, had previous felony criminal convictions while he lived in North Santa Barbara County, and the problem with Santa Maria being a ‘sanctuary city’ for illegal aliens is that it acts as a magnet for all sorts of criminals and undesirables. The FBI recently warned the public that Santa Maria is one of the most violent cities in California, and Mayor Patino and the city council continue a pattern of denial. I say the taxpaying public deserves to be protected from people like Julio Cesar Alonso, and if the politicians will not protect us, then we need to begin to protect ourselves from their clear and present threat In Santa Maria, a convicted illegal alien raped and murdered Mrs. Marilyn Pharis, a US military veteran, and the local politicians Patino and Lavignino, sought to keep the illegal alien from being deported. Let’s unite and begin mass deportations. I’m torn about this. On the one hand he will be prosecuted by the Feds for illegally entering this country after having already been deported. On the other hand our GUTLESS D.A. is letting a murderer walk. Dan Dow, you have an office full of overpriced investigators sitting down the hallway from you, what in God’s name could be more important for them to work on than a murder case? Perhaps instead of spending their valuable time getting coffee at Peet’s, lunch at Firestone and shopping downtown they could give a hand to the Sheriff’s detectives and help wrap this case up so this creep does not evade Justice. My guess is that politics had more to do with the D.A.’s decision than the actual evidence. It would be bad for a Tea Party D.A. to be mentioned on one of Trumps tweets or to be the focus of a Fox News special on criminal illegal aliens who defend after re-entering the country illegally, only to have your crack team of prosecutors bungle the case and get a hung jury or worse a not guilty verdict. I don’t understand why the Democrats don’t understand illegal. Illegal = criminal yet the Democrats want to hand our hard earned tax dollars over to programs that support and encourage those that break the law. I am all for giving a helping hand to those American citizens who need help, I am also for giving the boot (and finger) to anyone here illegally. Because with the growth of the Hispanic population they don’t want to do anything that would potentially anger voters. Politicians don’t care about murdered citizens, porous borders, or illegal immigration. They care about elections, and particularly flipping the state of Texas. The more people impoverished and dependent on democrat policies, the more votes they get. Really, They let this piece of trash go, if this was anyone else they would have pulled out all the stops to plant, I mean find evidence, Now ICE is gonna attempt to put him in prison, he’ll probly get away with that also, this is where Clint would come in handy. Federal prison? Build a penal colony on the Baja and have Mexico fund it. “a criminal record that includes multiple felony convictions” didn’t land him in prison years ago? Why wasn’t he imprisoned in Mexico when he was deported? I’d gladly have the U.S. pay for this penal colony if it gets these criminals and their families out of the U.S., and it would have to be cheaper to build and run a prison there than here. Lets make California a Sanctuary State, because the Democrats want to give people like this protection. Good then maybe people will have had enough and the Golden state can once again turn GOP Red, because this shade of deep blue is killing us.